Do any of these sound familiar? Hanging back in the airport lounge to charge your phone or laptop a few extra percent? Daisy-chaining your phone to your laptop and hoping both last to the end of your call. Carrying a bag of cables to charge your devices on the go? Mobile phones cut the telephone cable a long time ago. High speed wireless internet and 4G did the same for data, likewise Bluetooth for audio. However one cable is still left: the power cord – but perhaps not for much longer. Several brands of mobile phones, including Nokia, HTC and Samsung, already support wireless charging and there are accessories available to add wireless charging functionality to existing mobile devices (by changing the back cover or adding some extra electronics behind the existing back cover). In addition, the coffee chain Starbucks recently announced plans to install wireless chargers in its stores. Wireless charging isn’t new. The wireless charger in a phone works just like the electric toothbrush you have had for years in the bathroom. It works by creating an electromagnetic field in a coil in the charger that uses either inductance or resonance to send the energy to a coil in the device. The lack of external contacts means that the device can be hermetically sealed. A key requirement for the toothbrush, but also a great benefit for mobile devices, especially the new generation of wearables like watches and health monitors. However, there have until now been three key challenges for switching to a wireless charger: price, size, efficiency. Our innovative new wireless charging product, the NXQ1TXA5, addresses all these challenges, opening up the possibility for all new mobile devices to be charged wirelessly. Let’s start with cost. For mobile phone manufacturers to even consider putting a wireless charger in the box with new phones, it cannot cost much more than a normal wired charger. 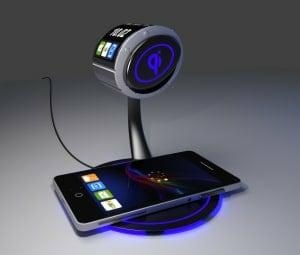 By using an innovative solution based on our advanced Class D amplifier technology, we have developed a single chip solution that slashes the bill of materials for a wireless charger, drastically reducing the number and hence cost of components needed to build one. Reducing the number of components to a single core IC also addresses the second challenge: size. The circuit for the transmitter has less than ten external components and fits on one side of a 2-layer PCB as small as a five cent coin. And it’s efficient too, with a no-load power of just 2 mW. That’s almost nothing! And when combined with one of our highly efficient GreenChip power adapters, such as our TEA1720BT SMPS controller, it still comes well within manufacturer’s five star rating for no-load power meaning you can leave it plugged in when not in use. Of course, the big benefit of wireless charging is convenience. Just place your phone on the pad and it starts to charge. No need to untangle the spaghetti of charging wires, or trying to plug a worn-out charging connecter into your phone’s charging port after having tried it first the wrong way round! So, now that all the major challenges have been overcome with this unique solution, what do you think? Will your next mobile phone charger be wireless? I was stricken by the fact that no one is using wireless chargers in Boston Starbucks, which are installed there for 2 years now. – and of course, data protection, data security and big data – while you are drinking your coffee and charging your phone for free, Starbuck collects data on you! This is an interesting move. There is a huge market that will welcome this product like South Asian countries where power shortage is very high. They need some of these devices. India, Bangladesh, Pakistan and Sri Lanka will get great benefit from these devices. Overall, this product is useful for anybody living anywhere. This is such a unique and innovative thing that everybody would love to have it. This will ensure that they can have their phones alive all the time. Bluetooth remote shutter is a cool wireless gadget designed to take your own picture, far from your own device. We are fond of taking our images every time. Well who doesn’t want to capture the best moments of their life, everyone. And now a day’s taking selfies are in vogue, so that must be proper and perfect shot. In most cases when you take a selfie through extending your arm might not give you a perfect picture you want, so in this situation Bluetooth remote Shutter is the best option.